The sailboat sat in the driveway for a couple of days without too much attention paid to it since the weather was not very nice. By Monday, that had changed, and it was dry enough to start hauling gear out, and seeing exactly what I had purchased. I now owned 2 boats, but the speedboat was up for sale. Lower part of rudder against tree. The PY23, at 22' 7", was almost 4 feet longer than my speedboat. It could sleep 4, had a cabin, and would cost much less to operate. At least, that is what we thought. While fuel is pretty much a non-issue with a sailboat, I now needed a dock at the marina, and the sailboat required a lot of parts and work done on it. The speedboat had to sell soon to finance what had to be bought for the sailboat. In the meantime, I would crawl all over the boat and make a list of things to do. The v-berth was fine. The cushions were in good shape. It should be comfortable enough for two people. With the hatch open, you could look up at the stars. V-berth with the anchor locker above, and shelves on the sides. A small hanging locker to starboard, with a shelf above. Nothing to do there but fill it with sailing gear. I'm sure the listing said the boat came with a marine head, but it was just a porta potty. That was of no use to me. I was going to have to install a proper flushing toilet. Location of head on the port side. One of the reasons why I bought this particular model of boat was the sliding door between the cabins. In many small sailboats the toilet is out in the middle of the floor, exposed for all to see. 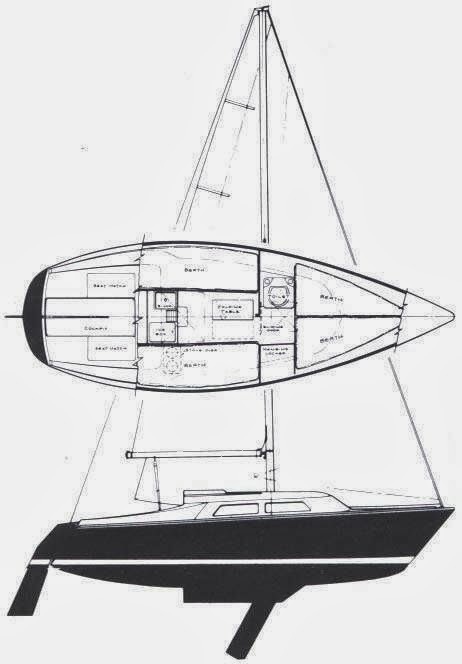 The PY23 is one of the smaller boats to have a semi-private head. The door is also good for when you have overnight guests travelling with you. Door closed and table folded up against the bulkhead. Lights on either side. The table folds down to feed 4 people on the 2 settees. The chain needs adjustment, and the cap was not install on the table leg/centerboard post. Table down, good for food or charts. In the galley, there was no stove, the icebox needed a good cleaning, and the water pump was not working very well. Icebox to starboard, sink and cupboard to port, step and drawer in center, shelf in back. The bottom 2 switches in the electrical panel were broken, like someone sleeping there had kicked them, or some gear was pushed up too hard. Either way, they had to be replaced. 4 switch panel for tuning on the various cabin and navigation lights. The worst problem with the boat was the cabin sole. In some sections the core had rotted out, and the fiberglass was cracking up. You had to be careful where you stepped. I was unsure how I would overcome this. Floor cracked up around the aft bilge access cover. The boat came with 3 batteries, but I could not get either of them to hold a charge, so a new, deep cycle marine battery had to be purchased. Three dead batteries. Only good for ballast. The engine is a 7.5 HP, regular shaft, 2-stroke Mercury outboard. There is a Saturn compass, and a knotmeter on the bulkhead. Another misrepresentation in the listing was shore power. I have no idea what the plug in the transom next to the engine fits. It is certainly not for a standard AC outlet. Looks more like something that plugged into an outboard for charging the battery. I'll need sometime for keeping the battery topped up. The mast has two winches. The one for the jib is a drum for which I have no handle that fits. The one for the main halyard is unusual, and well worn. Steaming light is barely hanging on. Windex missing from the top. The boom is fine, and comes with a pin to attach to the gooseneck. The anchor is a simple Danforth that is ok for lunch stops, but it only has a short bit of chain. I will have to replace that with a much longer length. Anchor, rode, boom and some fenders. So, quite a bit of work to do before it can be launched, but it is still early in the season.